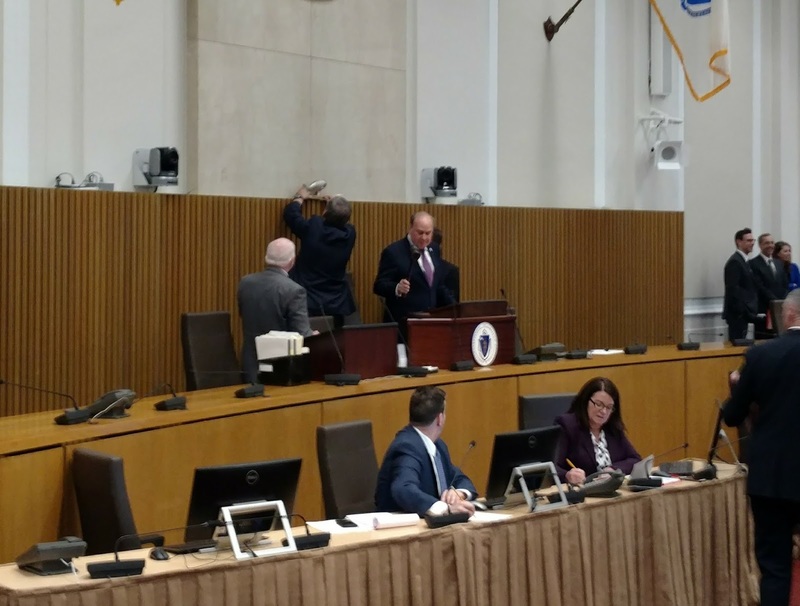 Today, the Senate met for the first time in a new temporary space while the Senate Chamber undergoes major renovations expected to finish in more than a year. 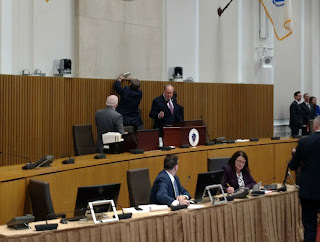 Tradition holds that we should not meet without the presence of a cod – today we took action and upheld that custom as we began a new session in Gardner Auditorium. I have been exploring the possibility of moving the brass cod that hangs above the chandelier once the chamber remodeling begins. Until that occurs we were facing a cod deficit until Senator Joan Lovely of Salem offered me a cod worthy of the cause, and I placed it in a suitable [lace above the Senate’s temporary rostrum. Chief Court Officer Paul Dooley will keep the cod safe under lock and key while the Senate is out of session. The first significant industry in the early history of Massachusetts was fishing the Atlantic. Gloucester is the oldest fishing port in America and our state continues to have a strong connection with the sea. The importance of maritime commerce was so significant that the Senate Chamber of the State House, where the House of Representatives met from 1798 to 1895, was always adorned with a five foot long carved wooden codfish – “the sacred cod”. When the House moved to a new chamber, the Senate took up the space and added its own fish often referred to as “the holy mackerel” – though it is in fact a cod. More than a century before the founding of our nation Massachusetts citizens sent representatives to what was then, and now, called the General Court. Established in 1630 under the Massachusetts Bay Colony, the General Court is now in its 190th two year session. God save the cod.